Bowl only. Picture for illustration. 4985 series bowl is standard after 6/94; 4978 bowl is no longer available. When replacing 4978 with 4985, the seat must be replaced with 500-D. 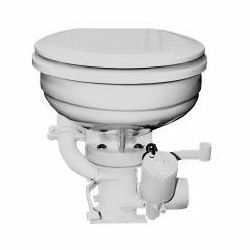 If you ever replace the bowl (4985 is the only available bowl), because of the lower profile of 4985, your EB toilet must be fitted with HT-3560-E operating arm. Replace HT-3560-B with HT-3560-E if necessary.